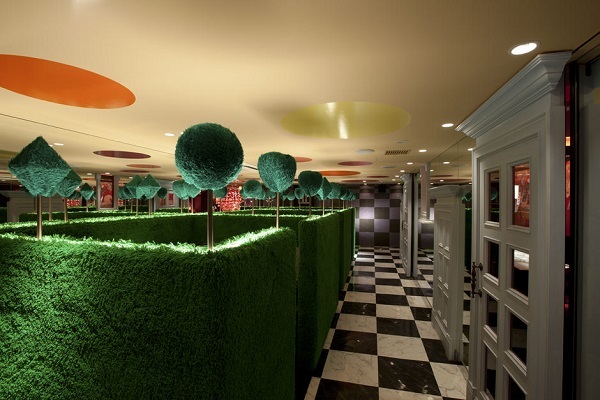 Restaurant in Alice in Wonderland theme. “Alice’s Adventures in Wonderland” is one of the most popular titles in literature and cinematography. 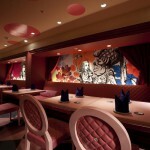 “Diamond Dining” company established four restaurants in different parts of the world based on this story. The most outstanding one is located in Tokyo, Japan. If by a lucky accident you find yourself in Ginza district of Tokyo, take a chance to visit a fairy-tale. From the outside this building looks as any other. But the fifth floor is definitely a piece of art interior-wise. 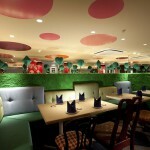 Design in this restaurant indeed is curiosier and curiosier from hall to hall. 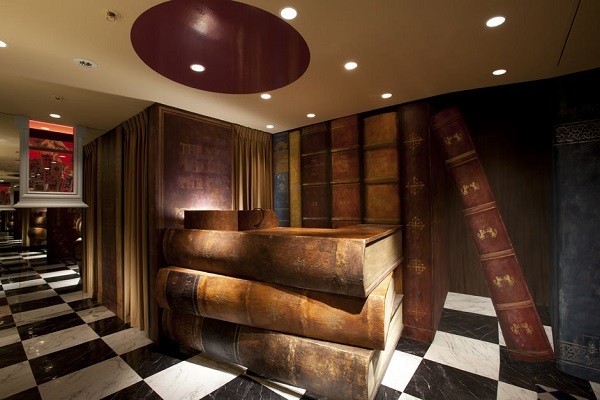 Bars made in the shape of huge books, famous watch, playing cards around the walls and ceilings. 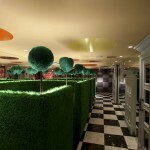 Architects obviously were inspired by the tea party atmosphere at the Mad Hatter’s table when designing the main hall. Everything corresponds to canons. There is a long table at the center of a room with vintage chairs. 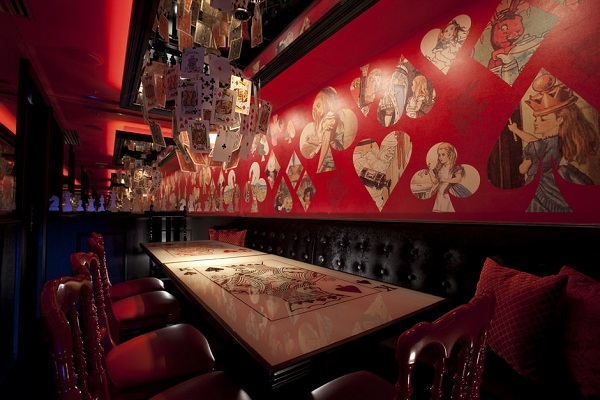 It’s also possible to get a private chamber also decorated in special style of this story. They are located in a hall with a labyrinth. 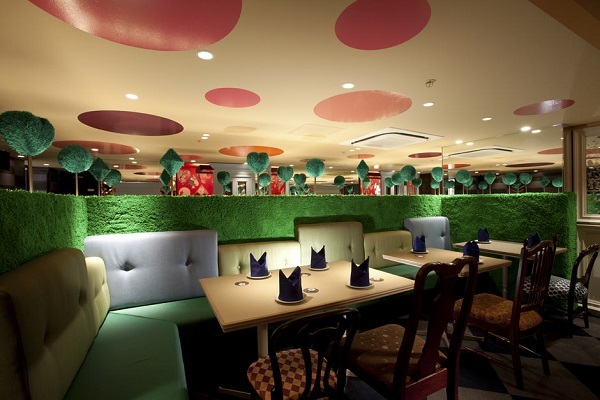 Yes – real green walls surrounding private tables. Even details like table-napkins or tableware come in a Wonderland theme. Of course there should be a tribute to The Queen of Hearts. 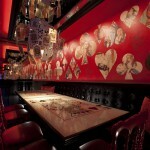 Red tables, red walls, playing cards and hearts. 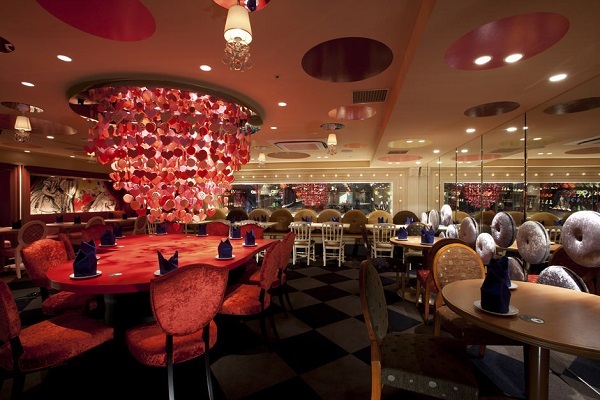 Plenty of red elements contrasted by mirrors creates a perfectly balanced color theme. By the way, floor is designed in black and white tile – always ready for chess game. 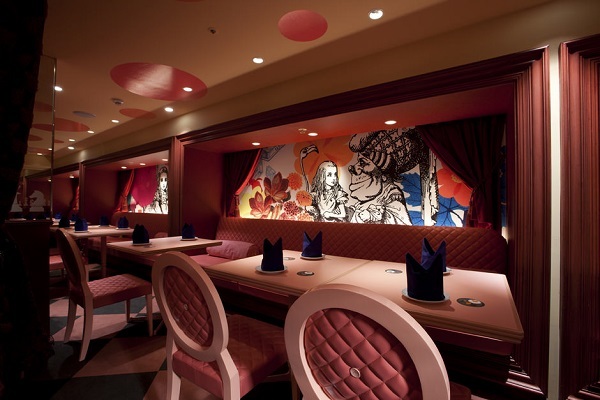 Chairs and tables in this hall look like furniture from a royal interior with Wonderland’s accents. They have a lot of ornaments and carvings. Inspired by a movie, creators did not forget the book either. Some walls have those wonderful black-and-white pictures from the book known to most adults. This place is a miracle for those who always seek something magical in real world for those adults who still have souls of a child, admiring everything that remains a fairy tale.